Numbered 51/100. Available individually or as a set of 10, all etchings are framed identically as shown below. Sizes are 5″ x 7″, framed 14.5″ x 16″. Born in Tularosa, New Mexico, he became a painter of western action scenes, wild animals, and Indian figures in realistic style and in the tradition of Charles Russell. Powell’s trademark signature on his paintings is the ace of diamonds, which also became his nickname. He was prolific, creating between 12,000 and 15,000 paintings and sculptures. He considered oil to be his best medium although he loved sculpting in terra cotta, stone, and wood. He also was skilled at etching. He moved to Montana at age one month. His mother was a schoolteacher, and his father was a cowboy foreman on the Ben Steven’s horse ranch, then a homesteader, and eventually a worker for the Glacier National Park Service. His life has involved many changes of location and personal circumstance, much of it due to his alcoholism, which he eventually overcame. Eventually he settled in Kalispell. Charlie Russell’s summer home was near the Powell home, and the Russells were family friends and encouraged Asa, nicknamed “Ace” in his artistic talent. He loved the Blackfeet Indians so much his father sent him to school on their reservation, and these people became one of his most frequent subjects. He also worked on the Bar X Six Ranch where he was a saddle-horse guide for many visiting successful western artists. He built a studio in Choteau, Montana and from there worked as a wood animal sculptor and did book illustrations. After his first wife died when he was 29, he was briefly in the Army, worked in a defense plant, and was in the plastic figurine business in Yakima, Washington, but his partner ran off with his second wife, obviously terminating their business arrangement. 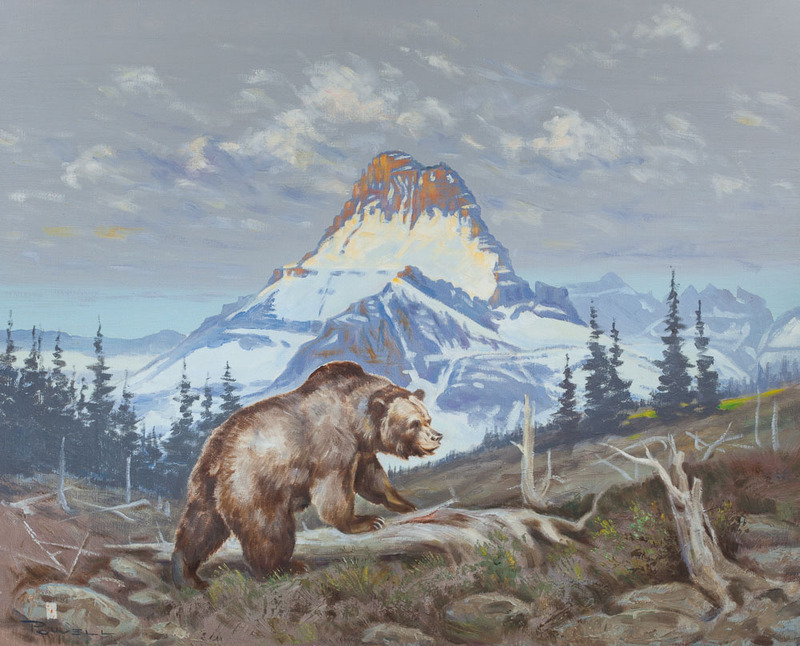 He returned to Glacier Park for six years with his young son and then at age 40 enrolled in the University of Montana on the G.I. Bill. But he disliked the abstract art being promoted, so he quit and took the Famous Artists correspondence course, which really helped him down the path that established his art career. In 1952, he married artist Nancy McLaughlin, and in Hungry Horse, Montana they successfully operated a gallery, but it burned to the ground in 1964. They divorced, and in 1965, he married Thelma Conner.